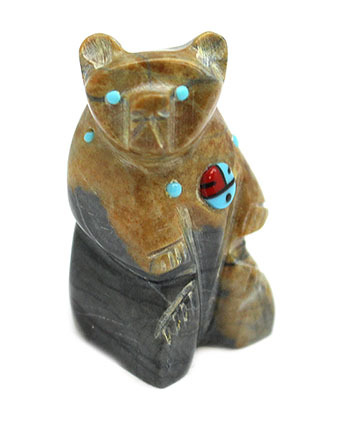 This sitting bear is carved out of picaso marble serpentine with a sunface on its belly and has turquoise dots for its eyes with turquoise dots inlaid around its neck. It sits about 1 1/2" tall, 3/4" long and about 3/4" wide. Carved by Zuni artisan Danette Laate. Size of bear may vary.